A Huddersfield arms expert is behind the stunning success of a Battle of Waterloo exhibition. And such has been the interest in the exhibition 200 years after the famous battle that it may become a permanent feature. 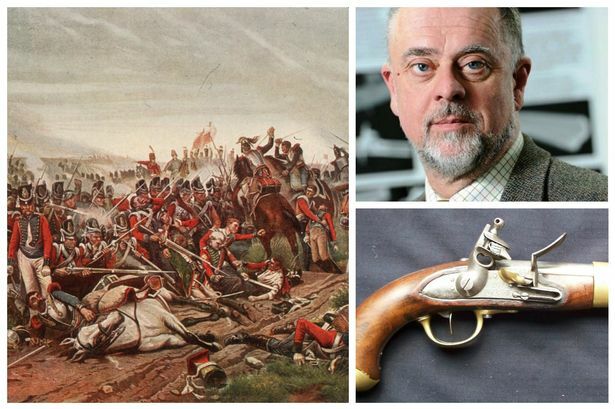 Universty of Huddersfield lecturer Dr Paul Wilcock has lent his expertise and weapons from his collection to the London exhibition and has also been invited to give lectures about the historical significance of the battle. Dr Wilcock heads the University’s Arms and Armour Research Institute and is noted for his knowledge of historic weapons, including the swords and firearms of the Napoleonic Wars that came to a climax when Britain and her allies – commanded by the Duke of Wellington – were victorious at the Battle of Waterloo in June 1815. Learn things that you did not know about the Duke of Wellington. The Duke of Wellington is the England’s most famous military leader and politician. From the very first moment emotions and history are brought to live.” The Duke of Wellington is a collection of historical events brought into modern times. Many illustrations are included in the different time periods of this book, some are added as two-pagers at the Appendix section at the end of the book. This work is an outline of history with greatest details as possible within the history of the Duke of Wellington. We have selected to do this through the medium of this biography. We believe that the “Duke of Wellington” presents an effective way to spark the interest. Our “Duke of Wellington” is a man of public life, political and military. In bringing this great nobleman before the reader, our intent has been to be as much historical as biographical. It is anticipated that the “Duke of Wellington” will be helpful to the student as well as readers interested in the man as a historical figure. We are supplementing this volume with plenty of personal details, a wealth of dramatic incident which give life and action to history, as well as a massive amount of illustrations to indulge the view of history. The boo will transport the reader into the time and get in touch with the Duke of Wellington who made England great. This volume should not be ignored, the details and the chapters full of facts transport the reader into the time and get in touch with the Duke of Wellington who made England great. It seems like that in 1814, after twenty-five years of war in Europe, it was finally coming to an end. The surrender of Emperor Napoleon ended up with his banishment to the small island of Elba. The Duke of Wellington is a collection of historical events brought into modern times. Many illustrations are included in the different chapters. Specifically, selected illustrations that are deemed important to the his-tory of the Duke of Wellington are added as two-pagers at the Appendix section at the end of the book. The object of this work is to outline the history with great clarity as possible and with significant details in the history of the Duke of Wellington. The “Duke of Wellington” presents an effective way to spark the interest of his story. It is anticipated that the “Duke of Wellington” will be helpful to the student as well as readers interested in the man as a historical figure. This volume provides plenty of personal details, a wealth of dramatic incident, as well as a massive amount of details to indulge the view of history.